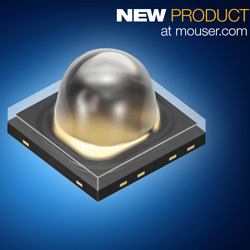 The SFH 4718A infrared LED (IRED), part of the IR OSLON Black family from OSRAM Opto Semiconductors is now available from Mouser. The diminutive but powerful IRED is the first in the line to offer a narrow beam angle of ±25 degrees, allowing illumination units for camera systems with a medium capture range with no need for secondary optics. With the LED, the company’s portfolio now includes three wavelengths (810nm, 850nm and 940nm) and three beam angles (±25, ±45 and ±75 degrees), with optical outputs varying from 0.3W to 2W. The device provides an optical output of 0.8W at 1A and an exceptional radiant intensity of 730W/sr. The device’s 850nm wavelength is scarcely discernible by humans but lies inside the sensitivity range of the camera sensors. The IREDs come in a small 3.75mm x 3.75mm package with a low thermal resistance of 16K/W (max) and ESD protection to 2kV. The device is perfect for a range of security and recognition applications, which includes 3D image capture and facial-scan access control. Engineers can also use the devices in systems to light areas monitored by CCTV systems, and also automatic license plate recognition systems.